The Samsung Galaxy M20 and M10 smartphones have received a new software update on the day of their launch. Samsung Galaxy M10 and M20 smartphones receive new software update. The update rolls out on the phone’s first sale. The devices get January 2019 patch. Samsung recently announced its M series of smartphones in India, which consist of the Galaxy M20 and the Galaxy M10. The company has pushed new software updates for both the devices, on the same day the two handsets went up for sale. The new software update doesn't bring anything major for the phones, except the January 2019 security patch, and is almost the same for both the devices. However, the changelog states that there is an improvement to the phone’s security and stability. It also adds new and/or enhanced features, along with providing an additional boost to the performance. The update is 102 MB in size for the Galaxy M20 and 64.74 MB for the Galaxy M10. SamMobile first noticed the new updates being pushed to the phones and we confirmed the same on our units. The Samsung Galaxy M20 is more powerful of the two handsets. It is powered by the Exynos 7904 chipset and sports a 6.3-inch FHD+ LCD Infinity-V display with a 19.9:5 aspect ratio. It comes in two variants, one with 3GB RAM/32GB storage that is priced at Rs 10,990 while its 4GB RAM/64GB storage costs Rs 12,990. The phone’s internal storage can be expanded up to 512GB via a microSD Card. The smartphone runs on the new Experience UI 9.5 that is based on Android 8.1 Oreo and is backed by a 5000mAh battery. In the camera department, the phone sports a 13MP + 5MP dual rear camera setup where the primary sensor is paired with an f/1.9 aperture lens while the other sensor gets an ultra-wide lens with f/2.2 aperture. On the front is an 8MP camera with f/2.0 aperture. The Samsung Galaxy M10 features a 6.22-inch Infinity-V TFT HD+ screen and runs on the Exynos 7870 SoC. It comes in 2GB and 3GB RAM options with 16GB and 32GB of local storage respectively. In terms of optics, the Galaxy M10 features a dual rear camera setup with a 13MP primary sensor with f/1.9 aperture and a 5MP secondary ultra wide-angle sensor with f/2.2 aperture. There is a 5MP sensor on the front and as there’s no fingerprint sensor, the phone supports Face unlock. The device also runs on the new Experience 9.5 UI that is based on Android 8.1 Oreo and packs a 3400mAh battery. 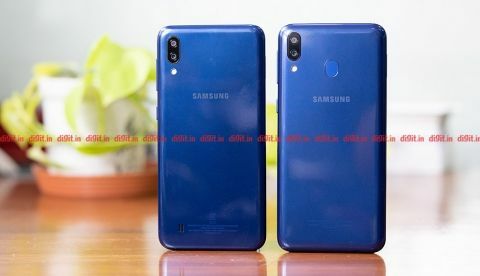 Samsung Galaxy M20 performance tested: Should the Chinese OEMs feel threatened?